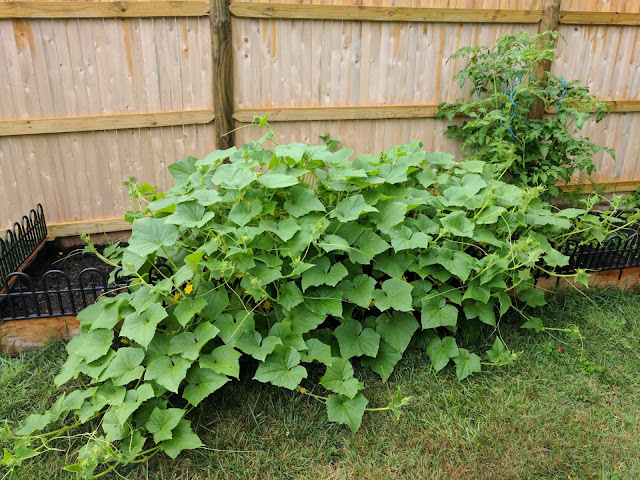 I'm going to have a LOT of cucumbers. The plants have grown incredibly over the past few weeks and are sprawling over everything nearby. I never expected they would grow so big! Hundreds of pretty yellow flowers are tucked away in the jungle of foliage as bumble bees dart from flower to flower, straddling the petals with their splayed out black legs munching on the nectar inside. 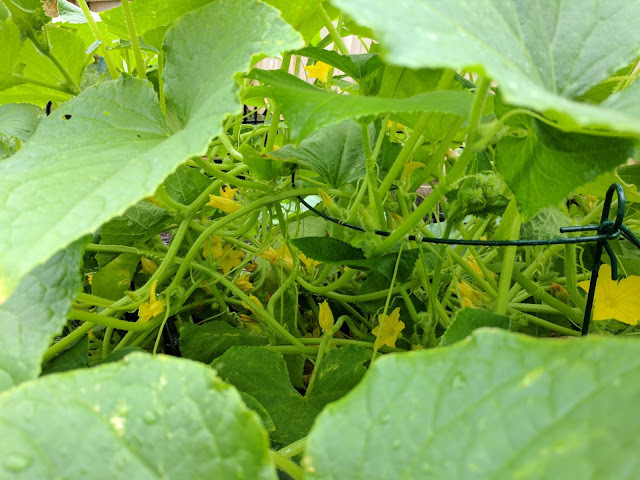 If I knew from the beginning how large my cucumber plants were going to grow, I would have built a much better structure for them to grow up on and would have given them much more room. As it stands now the plants can barely fit in the raised garden and have sprawled out into the yard! Above is just one small view of the myriad of flowers that will all turn into delicious fruits (of the vegetable-y kind). I'm going to have to give away a lot of these cucumbers, but it's very exciting to see them thrive and grow large. 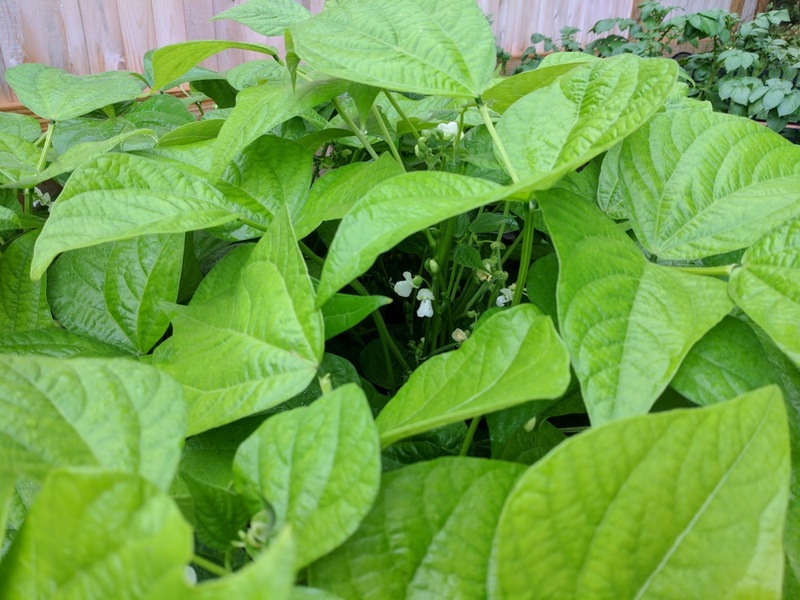 In addition to the cucumber plants, the bean plants have also begun flowering and growing beans. They're small so far, but there are lots of little white flowers dotting my bush beans. 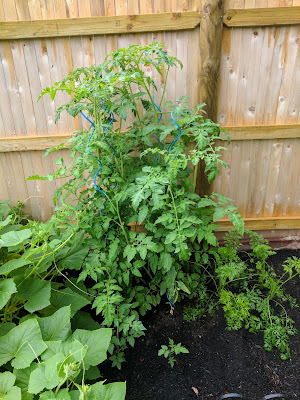 And the tomato plants? Well I put them on those twisted poles and they've already topped them! Soon my tomato plants will be as tall as I am! I'm very excited for the multitude of tomatoes, beans and cucumbers that I will have, even if my other plants aren't doing quite as well. All in all, it's very exciting to see the garden come alive with bees and flowers and everything growing so big! I thought I was spreading plants out too much when I originally started the garden, but it turns out I didn't give them enough room! Next year I will definitely plan a little more space for my plants (especially the cucumbers). I've also harvested some of the basil as well and it smells amazing! I haven't used it yet, but I'm looking forward to drying it or crushing it in a beverage as it has a wonderfully fragrant smell and I'm sure it's delicious. I've learned a lot so far and it's fun being a newb farmer! As my skills level up I'll be able to keep my entire garden flourishing and produce even more vegetables than I have currently growing and that's really exciting! Soon I should have a cucumber and tomato harvest to share so stay tuned!